Folie à Deux (French for “a madness shared by two”) was released late last year as Fall Out Boy’s fifth studio effort; a follow-up to their 2007 album Infinity On High. Having been in the industry for some half a decade, and principal lyricist Pete Wentz entering fatherhood with the birth of his son Bronx Mowgli Wentz, you would think that the boys would finally start adopting a more mature musical style. The Fall Out Boy on Folie à Deux is still that same youthful, loud, brash and energetic quartet that young fans around the world have come to love. The band however does exhibit greater ambition on this album, enlisting everyone who is anyone in the industry from Pharrell (of N.E.R.D. fame), Travis McCoy (frontman of Gym Class Heroes) to even Elvis Costello (acclaimed singer-songwriter currently married to Diana Krall) to be part of the production. With the enlistment of such a star-studded lineup, can the Chicago based pop-punk band triumph in reinventing their signature sound to keep things fresh and yet score enough hits to continue their commercial success? Read on for our take and find out how you can win a pair of tickets to Fall Out Boy – Live in Singapore. 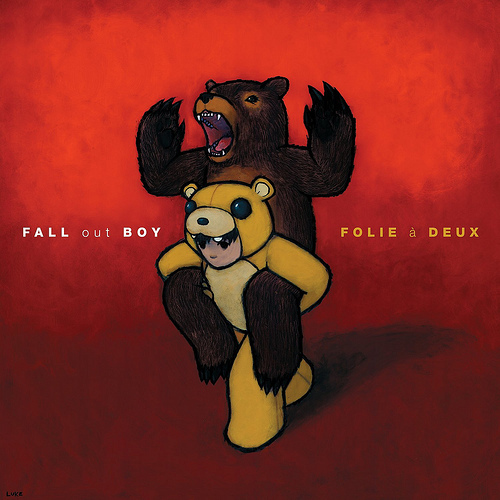 Much of Folie à Deux still remains a pop-punk album at its heart. The drumbeats are fast and the guitar riffs are fast and irresistibly catchy. But layered above these are various elements of funk, dance and a tinge of blues that is spread out across the 13 tracks on the album. “She’s My Winona” is one such track that retains the typical pop-punk sound while incorporating a funk-based instrumentation at various parts of the song. The outcome is a track that manages to smoothly bridge differences across the two genres to create a fresh –sounding and solid track with plenty of chart-topping capabilities. While a fair share of originality is evident (and greatly appreciated) in “She’s My Winona”, the same comment can hardly be extended to the rest of the album. It is as if the band decided to rip off rock’s most iconic acts on most of these songs. The lead track of the album, “Disloyal Order of Water Buffaloes” features a guitar line some 30 seconds in that is unmistakably similar to The Who’s “Baba O’Riley”. “20 Dollar Nose Bleed” borrows heavily from the whimsical sounds of The Beatles’ Sgt. Pepper’s Lonely Hearts Club Band, lead single “I Don’t Care” bears an uncanny resemblance to Depeche Mode’s “Personal Jesus” and “Tiffany Blews” follows closely fellow label-mate Cobra Starship’s electronic dance-punk sound. While rehashing iconic guitar riffs or entire songs is not an unusual practice in today’s industry, it does cast some doubt on the abilities of the band, especially that of songwriter Pete Wentz to come up with an extensive catalogue of fresh material. Sample “Tempest in a teacup/ Get unique/ Peroxide Princess shines like shark teeth” (Headfirst Slide Into Coppertown On A Bad Bet”). Or how about “My head’s in heaven/ My soles are in hell/ Let’s meet in the purgatory of my hips and get well” (W.A.M.S.)? Enough said, it IS Pete Wentz afterall right? A total of 7 artistes make cameo appearances on the slowing moving ballad “What A Catch, Donnie”. While it is fun to try spotting the different singers who have contributed vocals to the track, the cameos appearances do little to advance the song up to another level. In the end it just seems like an exercise of gimmicky excess that occurred for the sake of happening – “What A Catch, Donnie” could have done without the cameos and it would leave little difference. Folie à Deux is definitely a listenable record by any measure. Its easy-along lyrics, big ol’ choruses, catchy beats and polished arrangement makes the album well-suited to help the band advance its commercial pop success. What the album doesn’t do however is to provide depth. The palette of sounds were certainly expanded on Folie à Deux compared to Infinity On High or From Under The Cork Tree through the introduction of other genres, extensive use of a horns section on several songs and err, ripping off rock classics. This lateral growth to cover more ground however does little to show that the band does possess some level of depth and does not need to constantly hide behind a superficial wall of big and loud sounds. Age will catch up with the boys (youngest member Joe Trohman is turning 25 this year) and it will soon be time for them to grow up and act their age. If anything, the band needs to finally answer the question “Who exactly are the Fall Out Boys?” to give listeners something to truly latch onto and believe in. Whether they go down as the band with the guy who married Ashlee Simpson, or worthy successors to the Green Day empire, will depend on the musical and lyrical growth they exhibit in the coming years. Overall, Folie à Deux is a decent pop album that earns itself 2 out of 5 stars. Here’s your chance to win a pair of tickets to the the concert! Simply tell us why you deserve to catch the Fall Out Boy concert, and send us your full name, contact number and IC number to contest.urbanwire@gmail.com. This contest ends on Feb 3. Early bird top-tier ticket buyers can redeem their free albums in exchange for their ticket stubs at HMV (only), at the Heeren.